Finally... my kids actually, physically bowled. They have bowled on the Wii on multiple occasions...but they told me it was definitely harder in real life. Which just reinforces my idea that some things you can't digi-experience for the full effect....actually probably every thing. Sheesh. And then Myself...and a little bowling history...I don't think I've bowled since my first date with my husband (11 years ago...really... that long...goodness!) and it was "Rock and Bowl" night and I wasn't really concentrating on "my game" per se. Anyway, I finally kinda figured it out at the end and it wasn't with this yellow ball, it was a killer, red 16 pounder...but like I said, it was the end. I lost badly and I was up against the hubs and three kids....oh well at least I had a blast which is all that matters, although I do love to win. *sigh* I also used muscles in my legs that I must not use often because I was sore for a couple of days....from bowling no less. As a side note, I did NOT use the bumpers...just wanted that to be clear! One of the winners...just checking her mad skills. Again, doesn't she look overjoyed? Too overcome with emotion to barely crack a grin. Dennis would roll the ball down the lane at approximately 2-3 mph. And after such a wondrous throw, he would ALWAYS turn and walk away until we'd yell...."Look, look at the ball!" I guess he was so confident in his success that he didn't have to watch and make the obligatory "just a little to the right" motions. Time will eventually lend him a competitive nature I am certain. 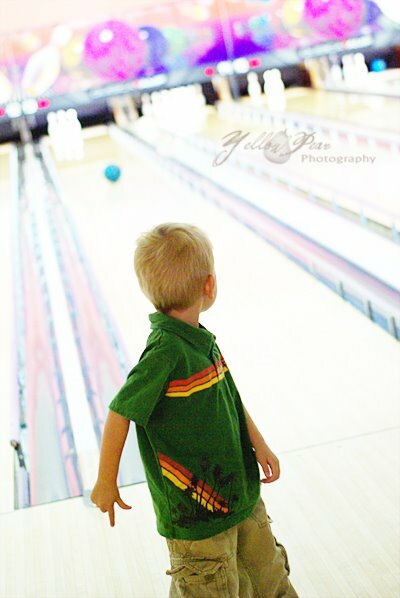 Q enjoyed his first bowling adventure getting passed from person to person and watching the bright lights. And of course slurping on his fingers. Here he is with Aunt Becca. Cousin S looking at the glorious selection of bowling balls to choose from. And here we have little Cousin C who was having a bit of a hard day. 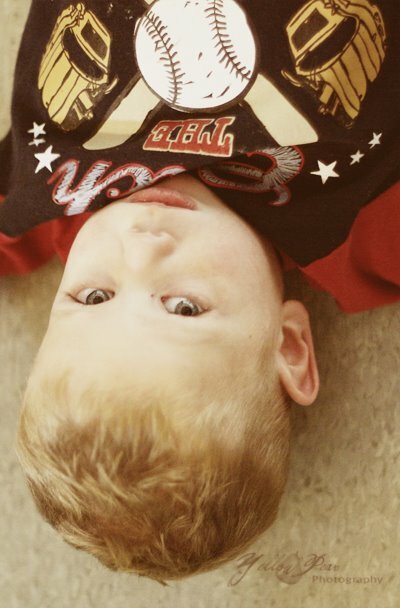 No one would let him run solo through the bowling alley or throw the ball down the lane to his heart's content. So to show his distaste, he decided to make a statement I suppose, and just hang out after one of his turns...and you can't see the ball anymore, so you can imagine how long he chilled there. Then he got up and walked over by me and lay down again with this look on his face. Gotta love being 3! All I can say is I am glad we finally did that in real life. Phew! Didn't want that to go undone too much longer! 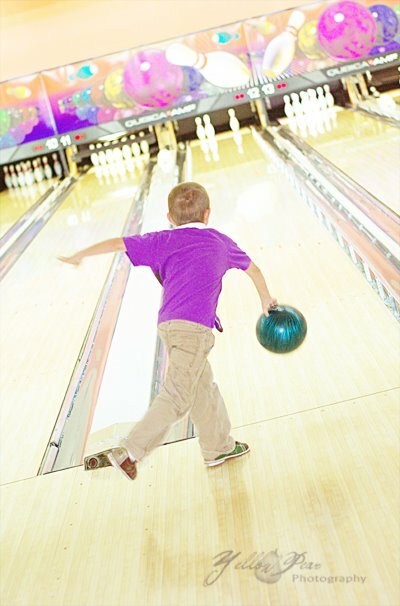 Your bowling pictures look great! 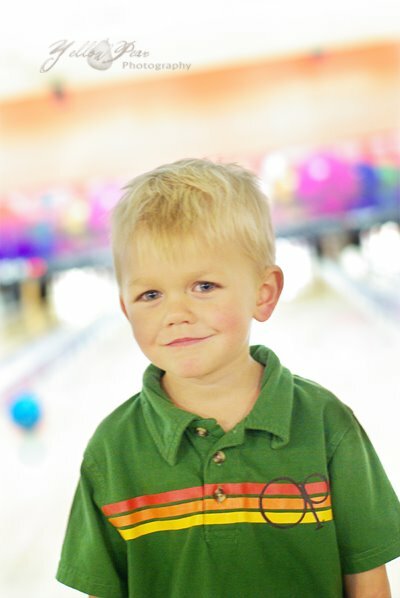 I especially love the first one of C. Did you plan for him to match the colors of the bowling alley? Fun times. 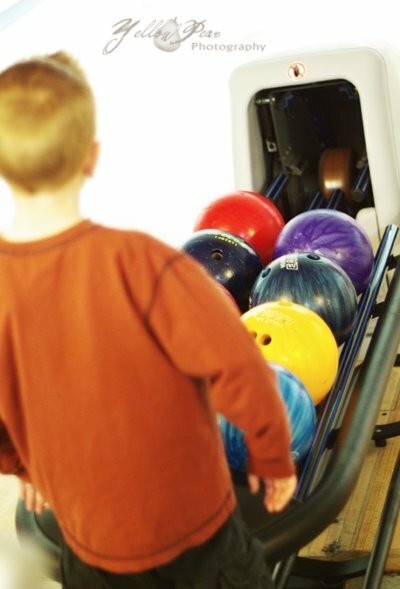 We've taken our kids bowling a few times and they can only stay focused for the first few frames and then we lose them to the arcade... Still fun times. i love what B is wearing! so cute!! 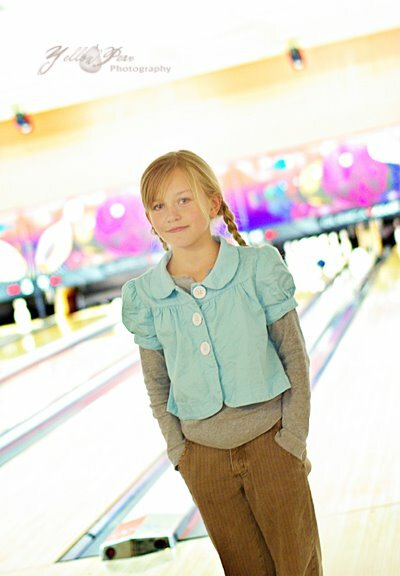 and aren't bowling ally's usually dark and dreary...i love how bright & colorful these are! Wasn't Mi & Ch's first date bowling too? Random thought. Bowling makes wonderful marriages!! My my E, your blog is getting full of pictures and descriptions...isn't it lovely!!! 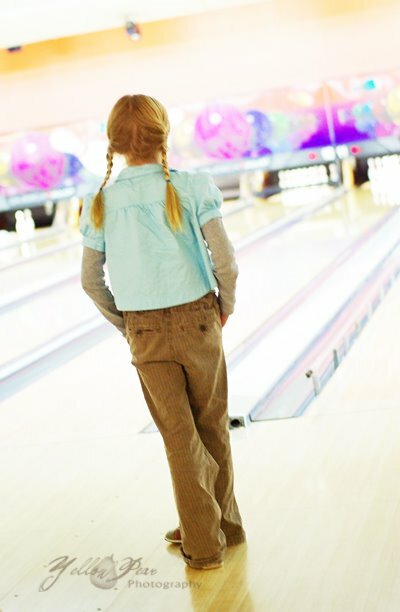 :) I enjoyed our day together as always, and I enjoyed your post...I love bowling I wish that we had an alley close by. 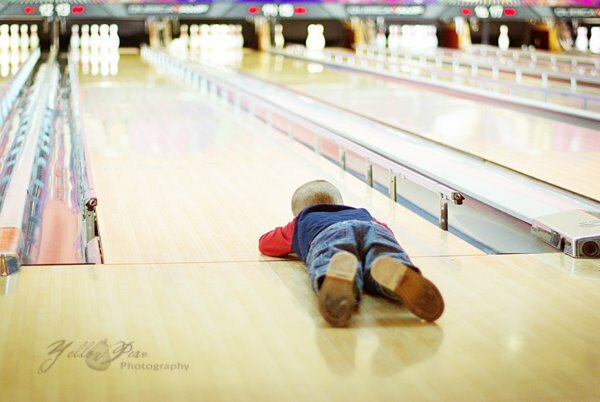 I do love bowling.... I really do! Hey I like that half face picture of me I think it shows my best side!! LOL. That day was fun minus the drive home which was eternal and soggy!!! Sure was fun even though it was a little crazy with little C thinking it was always his turn and wanting to push his ball at 1 mph. Love the pictures.